If you have a preschooler who LOVES to play on the phone and/or iPad? You may want to install Fanny Foozle. The educational app is about a town called Flamboozle, and is filled with fun and unique characters. Fanny Foozle is a jelly bean-looking character that loves alliteration, singing and playing with her best friends, Fenelope and Dumple. She has a Foodle dog named Sam and goes on many adventures! She starts out with a catchy tune, that you will not be able to get out of your head! My neighbor really liked how the text changed color to highlight which words were being read, making it easy for her son to follow along. The e-book has a “read along” or an “I want to read” option so that your child can follow the story and practice their reading skills, or read the story entirely on their own. My neighbor’s son thought Fanny Foozle was a good story! His favorite character, was the dog named Sam. When Fanny lost Sam, he wished he could help her find him. 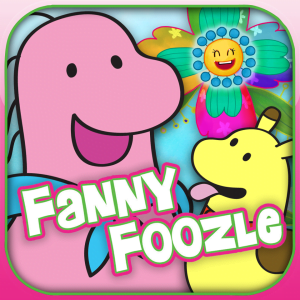 The Fanny Foozle FREE e-book is available on Google Play, there is more Fanny Foozle fun to be had in the iTunes store with the Fanny Foozle Fun and Fanny Foozle Pop apps. You can also find the e-book on Kindle for $1.99. Learn more about Fanny Foozle on Facebook and Twitter! Would you love to have this for your child? You’re in luck we have a giveaway for the book version of the story app coming up!